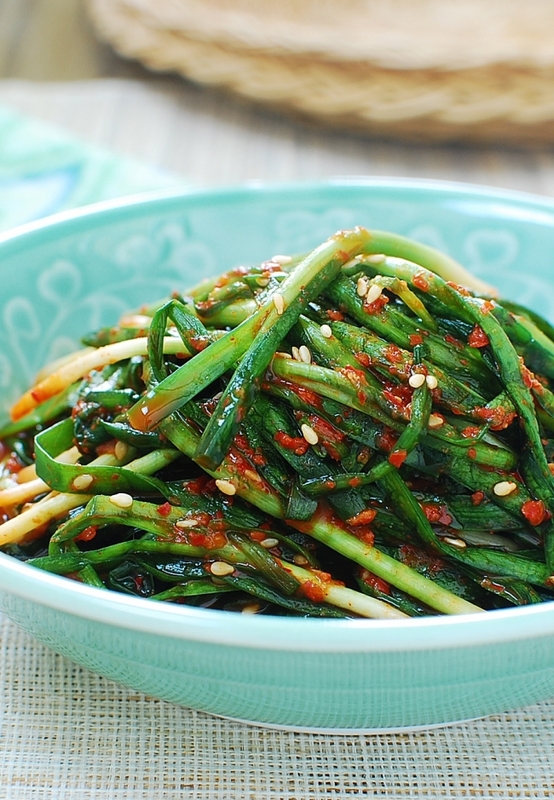 This kimchi made with garlic chives (buchu – 부추) is one of the easiest kimchi variety to make! 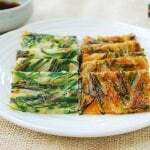 Buchu kimchi is a common summer kimchi that is especially popular in Korea’s southern provinces (Jeolla-do and Gyungsang-do). Garlic chives are distinguished from regular chives by their flat leaves and distinct flavor that’s like a mild onion with a delicate garlic flavor. 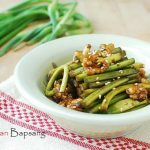 Here in the U.S., Chinese garlic chives are more common, but Korean garlic chives also appear in Korean markets in the spring and summer. 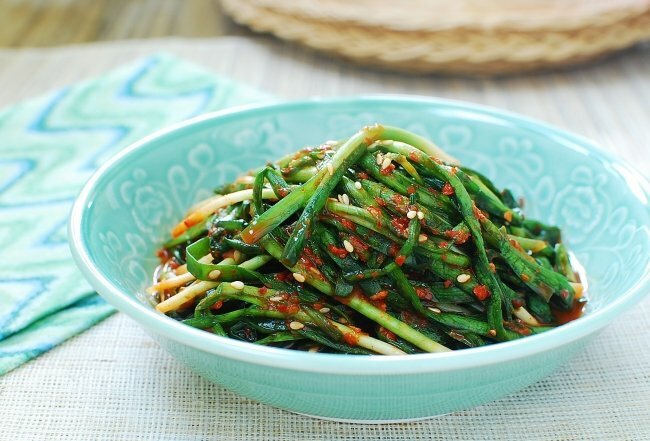 Korean garlic chives are thinner and more tender so they are better for making kimchi. The best Korean chives I get around me are from my sister-in-law’s back-yard garden. I think I’m going to get a clump or two from her and start growing them myself. If you can’t find Korean chives, by all means, use the Chinese variety. Look for ones with thin and narrow blades. 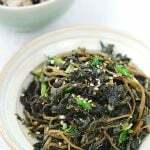 Buchu kimchi is typically seasoned with myulchiaekjeot (fish sauce made with anchovies). You can also add a little bit of saewoojeot (salted shrimp), as I did in this recipe. No pre-salting is necessary. If you like, add a little bit of minced garlic and/or ginger, but I prefer to omit it to let the natural flavor of the garlic chives come through better. Whisk together the glutinous powder and 1/2 cup of water. Simmer over low heat, stirring occasionally, until it thickens to a thin paste. Let it cool. Yields about 3 – 4 tablespoons. Wash the chives thoroughly a couple of times, gently shaking them in the water to get out any dirt between the blades. Drain. Cut the chives into 2 or 3 sections crosswise. Mix all the seasoning ingredients along with 1/2 cup of water in a bowl. Add to the garlic chives. Gently rub the seasoning mixture all over the garlic chives to evenly coat them. Let stand at room temperature for 2 to 3 hours until the chives wilt and reduce in volume. Transfer to an airtight container or a jar and refrigerate. 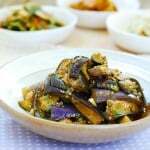 Buchu kimchi can be eaten right away, but the flavor develops as it ferments. It will keep well for 2 to 3 weeks in the fridge. Thank you, Irina! I hope you find it soon. Enjoy! 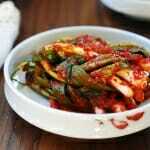 Your buchu kimchi reminds of my appetite-less days of summer in Korea. I often wet my rice in plain water and ate with well fermented buchu kimchi one of those tiring days. It was still delicious. I haven’t seen those thins Korean buchu quite a while. Most of them I see where I live are the Chinese kind which are not that suitable to make kimchi. Lovely kimchi, Hyosun! 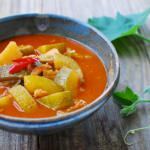 Can I use Vietnamese or Thai fish sauce? How is the Korean version different? Yes, you can. I know some of my Korean friends use it for their kimchi sometimes. They just have different flavors. I have to look for buchu at the Korean market, I grow the Chinese variety but definitely want to try these and see the difference. The dish sounds great, nice and summery. Ahh! This is my favorite type of kimchi! Thank you for sharing the recipe! Hi! Don’t quite understand what you mean by “mix all the seasoning ingredients along with 1/2 cup of water in a bowl”. Isn’t the 1/2 cup of water already used to make the glue? That’s just additional liquid you need for the seasoning, nothing to do with the water you used to make rice paste. Hope this helps. Just made this! Very excited to let it ferment a little. 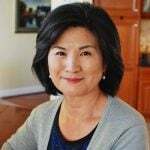 My 암아 (umma, mom) never taught me to cook Korean food, so I’m glad I found this site. I get a hankering for homemade 김치 (kimchi) all of the time. I substituted honey for sugar. Next time, I might add pureed Korean pear. I am glad you found my blog too! 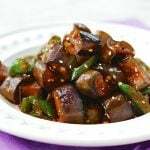 I have not used pear in buchu kimchi so let me know how it turns out if you try it. Just made this an hour ago and it already tastes yummy! Thank you Hyosun! 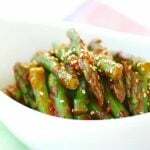 Have you ever experimented with a vegan version of these kimchi dishes?